An old-school real-time strategy game set in a fantasy world and created by Petroglyph - an experienced team popular mainly games such as Star Wars: Empire at War, Universe at War: Earth Assault or Grey Goo. 8-bit Hordes is based on the classic RTS mechanics. 8-bit Hordes for PC is an old-school RTS game set in a fantasy world. The game pays tribute to such classic strategies as the WarCraft series. It was created by Petroglyph - an experienced team popular for such real-time strategies as Star Wars: Empire At War, Universe at War: Earth Assault or Grey Goo. Interestingly, in terms of the multiplayer component, 8-bit Hordes is compatible with 8-bit Armies - the studio's previous game released several months earlier. 8-bit Hordes for PC is a real-time strategy game based on the classic concepts. Two rival factions constitute the core of the conflict here, and those are the ruthless Dark Orcs (along with their allies) and a coalition known as the Lightbringers, gathering humans, dwarves and elves. The game follows the patterns established by the classic representatives of the genre, thus the player gathers resources, extends their base, produces units and fights the enemy's armies here. Similar to its predecessor, 8-bit Hordes is incredibly player-friendly as it comes to performing different actions - the game was created mainly for the RTS fans scared-off by complexity of rules and controls that constitute an inherent part of many modern-day titles belonging to this genre. 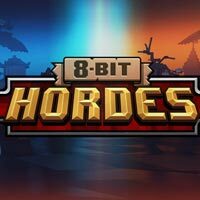 8-bit Hordes offers an incredibly wide set of game modes: a singleplayer campaign comprised of 24 missions, a co-op mode (12 missions) and 10 maps for the multiplayer component (a classic PvP experience for up to 8 players). Also, the multiplayer maps can be used in the Skirmish mode when playing against AI-controlled forces. What is definitely a positive concerning this game, is the fact that as far as the multiplayer mode is concerned, 8-bit Hordes is fully compatible with 8-bit Armies - a game released several months earlier. As a result, no matter which of the two games one owns, they can compete against both those playing 8-bit Armies and 8-bit Hordes - the maps are shared and factions are compatible with both the games. 8-bit Hordes for PC is similar to its predecessor in terms of the art style used. Despite the fact that the titles of both the games can suggest that the player will be dealing with old-school visuals typical for both 8-bit computers and consoles, Petroglyph's games stand out with incredibly colorful graphics based on voxels; when it comes to the character models and environmental objects, they seem to have been made of blocks. The game's original visuals are complemented by fully destructible environments and a professional soundtrack composed by Frank Klepacki - a former employee of the legendary Westwood Studios. He is popular for creating soundtracks for such classics as Blade Runner, or such series as Lands of Lore, The Legend of Kyrandia, Dune or Command & Conquer.